Yemen Blues, who combine jazz and world music to create a modern Israeli jazz sound, made their North American debut at Venue Night Club this past Thursday. Their eclectic mix of sounds, and expressive energy, had the crowd moving to the pulse of the music within moments, easily erasing the bitter memories of the Vancouver traffic, and chilly wait in line that had brought us to that moment. One of the first things that I noticed about this band was the interesting array of instruments that were on stage between the nine musicians; some of which I’d never seen before. The collection included what looked like mini symbols on strings, a singing bowl, a trombone, a cello, a trumpet, a flute, and an assortment of drums, to name a few. The sound they produced together danced within the rhythm that Kahalani’s voice created, and combined to tell the story of each song. For me, this quality in particular stood out, as the words being sung were in a language that I couldn’t understand, yet I was still able to feel as if I was a part of what was being conveyed. As Kahalani stated at one point, “It doesn't matter what language you speak. Your language is my language." A second element that stood out was the way in which the musicians seemed to feel and live the music through their bodies and instruments. Kahalani, in particular, moved with the notes, no matter where they took him; whether this meant hopping around the stage, dancing with the other musicians, or solemnly swaying on a bar stool. Last, but far from least, I noticed the music itself; smooth, alive, powerful, and fascinating. The band skilfully transitioned between ever changing metres and keys, while the singer made use of his immense range and unique tone. While the songs themselves were fascinating, complex and moving, the transitions between songs stood out to me as well, as there was always an instrument being strummed, stroked or sung; reminding me of how life in itself is never completely silent. The evening ended with an energetic encore and a roaring ovation from the crowd. 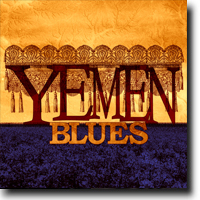 Yemen Blues stole the hearts of the crowd and I have a feeling will be welcomed back with open arms the next time they come this way. Thank you to the organisers of the Chutzpah! Festival for bringing this talented and fascinating group to Vancouver.